We don't usually write about entertainment channels of the sitcom / soaps / serials variety (as opposed to entertainment channels of the news / current affairs variety) but there's a new channel airing across Pakistan for about the last two months causing all sorts of waves that is interesting to us for a number of reasons. For one, Urdu1, as the channel is named, seems to have hooked a substantial number of viewers, which seems to be giving its big-name rivals in the television entertainment business all sorts of palpitations. 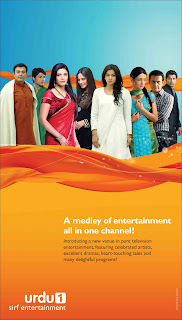 No doubt a major part of the reason for its sudden popularity is the fact that it is broadcasting some of the most popular Indian soaps, whose ratings on the illegally (but widely) broadcast Indian entertainment channels such as Star Plus and Colors, put to shame ratings of all other Pakistani channels. It is technically able to do this because it is actually not a Pakistani channel (which are subject to far more restrictions regarding Indian content) but a 'foreign channel', based out of Dubai and only having 'landing rights' in Pakistan. But it is also benefiting from the fact that it still broadcasts most of its programming without the massive commercial breaks that have become the characteristic of Pakistani entertainment channels and which have become the bane of viewers. Unlike Pakistani entertainment channels which offer up their programming in blocks of, often, seven minutes or less, and where an hour of programming can include 22 minutes or more of commercials (also violative of the terms of their licenses, which stipulate no more than three minutes of advertising after every 15 minutes of programming - this stipulation has been challenged by the Pakistan Broadcasters Association in the Sindh High Court where the case is pending), Urdu1 so far has been getting by with running ads mostly at the beginning and end of their content. Viewers, fed up with the extended and excessive commercial breaks on Pakistani channels, seem to have given their approval. By far the most fascinating part of the programming on this new channel from a sociological point of view, however, is the inclusion of - and unexpected popularity of - some of its dubbed offerings. Urdu1 is also offering Latin American and Turkish soaps which, despite the fact that they contain non-desi actors whose voices have obviously been dubbed into Urdu, seem to have found wide acceptance among the usual female population that comprises the bulk of the viewers of such programming. So far, Pakistani channels have rarely ventured into the dubbing territory (although Geo Entertainment has shown a couple of dubbed films in the past) because it was generally believed that audiences did not like watching such dubs and could not identify with non-desi actors and that the viewership could not justify the costs of dubbing. It would be interesting to see when rival channels also begin to add similar programming. And we can bet it won't be long. But Urdu1 is also making waves for other reasons. A conglomerate of its rivals, including Hum TV, Geo Entertainment, ARY Digital and Express Entertainment have filed a case in the Lahore High Court against the granting of 'landing rights' to the new channel (which basically allow it to be distributed legally within Pakistan), which was launched in Pakistan only in the second week of June. They have challenged the Pakistan Electronic Media Regulatory Authority (PEMRA) to justify the grant of the license, which they claim is against PEMRA's own criteria for such licenses. For one, these rivals argue that any foreign satellite channel must have been operative for at least three years before it can be considered for a 'landing rights' license , and that Urdu1 did not fulfill this criteria, having been launched (even by its own admission) "in the Middle East" only in June 2010. They also claim that foreign channels are, allegedly, not allowed to have more than 10-15% of their programming in Pakistani languages under PEMRA rules and thus Urdu1 falls afoul of this criteria as well. Urdu1's rivals may be technically right (we tried but could not locate these stipulations on the PEMRA site) but it should be fairly obvious from this petition that the big Pakistani entertainment channels are very apprehensive of what Urdu1's popularity could mean for their revenues. And let's be clear about one thing: their loud cries about 'foreign cultural content' and 'subversion of Pakistani culture' are only smokescreens for the real issue of revenue and profits. There are a few points to consider here. A) I am no fan of the mind-numbing histrionics of Indian soaps, but is the "trade protection" being sought by Pakistani channels against Indian television content legitimate, especially when one considers that all of these same channels vie to run - and go out of their way to promote - Indian content such as awards shows and films when they can? B) Is Indian content the only issue? It was considered the main issue because of the supposed easy identification of Pakistani viewers with Indian storylines and actors, and the reason that nobody bothered that much about Western content, assuming it catered only to a small niche of viewers. How will that point-of-view fare with the popularity of dubbed non-Indian content as shown by Urdu1? To take the point further, is isolationism something to aspire towards? C) One can make legitimate arguments about the need for smaller trade / production entities to have benefits that level the playing field somewhat against larger entities that have the advantage of scale. But does that argument really hold for 'cultural products' in an increasingly globalized world where technology makes the cultural products of other nations easily accessible? After all, the 'protection' offered to the Pakistani film industry for over 40 years did not really help it to survive or become better did it? D) There is a fundamental issue at stake also about who benefits from such protection: does it actually benefit people it claims to serve or just a few corporates such as television channels, some big local production companies and their owners and investors? After all, all viewership surveys in Pakistan attest to the continuing popularity of Indian soaps despite their official prohibition and despite the rantings of the moral brigade. If viewers insist on watching shoddy melodramas and continue to find ways to do it, is it the job of government to deny them legitimate avenues to do so? Finally, there is another significant aspect to Urdu1 which has piqued our interest. Its Pakistan license holder is a company called Horizon Media (Pvt) Ltd. which is fairly untraceable on the web. For a channel that supposedly launched "in the Middle East" (out of Dubai) in 2010, Urdu1 also has no website that we can locate. Its CEO is a man called Faraz Ansari, who used to be the former General Manager of Ten Sports and apparently worked for other media companies earlier as well. However, we have learnt from very reliable sources that the real people behind the channel are three "heavyweight" legislators of the ruling Pakistan Peoples Party. 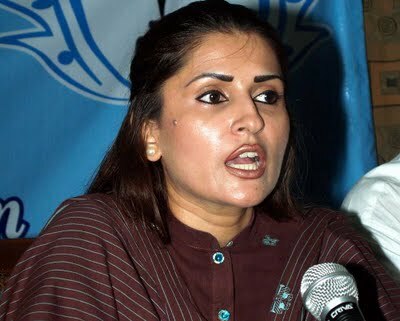 In fact, we have been able to identify one of them: Ms Shazia Marri, now elected as a member of the National Assembly and former/ current minister for Information and Electric Power in Sindh province. Another may be current Sindh minorities minister Dr Mohan Lal, whose brother Mr Jai Prakash, a Shikarpur-based trader, is alleged to be the main financier of the venture. Shazia Marri: new media mogul? What makes the whole venture more curious is that, according to our sources, Ms Marri has also been in long-running talks to buy an FM channel called Josh 99FM which operates out of Karachi, Lahore and Hyderabad and is "affiliated" with three other unnamed FM stations, claiming a total "potential" listenership of over 60 million people. Josh FM99's Chief Executive is Mr Sarmad Palijo, the younger brother of the sitting Sindh Culture and Tourism Minister Ms Sassui Palijo. Adding to the intrigue is the fact that those in the know claim the purchase negotiations have dragged on because of the involvement of Ms Faryal Talpur, another sitting PPP MNA and the sister of President Asif Zardari. Our sources claim they do not know what Ms Talpur's stakes are in the matter but that on more than one occasion, she intervened once the price had been tentatively agreed, to ask the parties to reconsider the price. According to our sources, one intervention was to urge a lowering of the price, another was to raise it, which may indicate that Ms Talpur had been requested to intervene by both sides at various times. Is there a new media empire in the offing? The covert entry of these PPP heavyweights could be an indication that media competition in Pakistan may about to be raised to a whole new level. One where the rules themselves could be changed, nearly at whim to kill or constrict the competition. Tiresomeness at the loud mouth antics of commercial Pakistani news media could be an environment used skillfully to put them in some type of box. If this came to pass, it would only re-confirm that the politicians of Pakistan are unable to improve their performance, but will hold grudges against their critics. The encouragement of good quality entertainment, as a distraction from typical Pakistani infotainment fare, is a whine that supporters of the PPP have made against our news channels. That they should focus on proper entertainment rather than spreading the news as melodramatically wide and far as possible. This is certainly a new dimension; let's see how the regulatory fight plays out in relation to Urdu One. Your translation of Ishq-e-Mamnoo(n) caught my attention. In the picture it is written with a noon ghunna, which makes the word nearest to 'mamnoon', i.e grateful. Whereas you guys have translated it as 'forbidden' which would mean the Urdu mamnoo with an 'aen' at the end. Seems like there is a mistake somewhere in there. @Sabahat Zakariya: Sabahat you are absolutely right. Our mistake (unless Urdu1 has got the name wrong in Urdu). Have made the corrections. Thanks. @Sabahat Zakariya: Whoops. Turns out the image we got was the one with the misspelling. It is, after all, Ishq-e-Mamnoo or 'Forbidden Love', which makes far more sense semantically than 'Grateful Love'. Haha,Ishq e Mamnu is the next big thing here in my circle and I am talking about the people from 15 to 30 years of age and we all love the drama. Not a serious thing for us, it's more like a comedy and beauty pageant for us all and gossip. PS. All of us don't watch gossip type of dramas or entertainment shows but this drama just attracts us so Urdu ! actually nailed it. They found a market. It might not be long term, who knows. Hmm... the plot seems to thicken, no? All the new PPP 'media moguls' and interior Sindh connection/s, why does one get the feeling that this is ultimately another "Zardari Super Project" ???!!! Same news, different language, different market, different style. Urdu1 is actually all about Ishq-i-Mamnoo. There other dramas are good but we have watched better content on other channels. Really don't understand why Indian soaps are so popular among women here. They lack content, they portray the women in the worst possible manner and now Urdu1 is airing these pathetic soaps as well. They have to dub some good dramas and air some right after Ishq-i-Mamnoo or they will nose dive after last episode of the drama. I wanted to know who they are but the contact details are not given, there is no corporate profile available, the advertising tariff is no where to be seen and I wonder how the companies are approaching them for advertising - or may be they are approaching the companies, themselves. If you have noticed, the advertisement breaks are getting longer and longer slowly. Of course finally they will end up violating terms of their license. They are doing business and why would they not try to sell every second of their channel?